Want to have jewelry at your home or office? Just e-mail me and I will come to you, it’s easy, fun and rewarding! Best of all, the host gets $30 (or 10% of sales if more) worth of free jewelry, just as a thank you for hosting. Your guests or employees will love socializing and discovering the unique selection of handcrafted items (and will thank you!). The more friends you invite and the more they purchase the more you make! You can also do a lunch party” or “wine evening“, whatever you think is the best idea and most suitable for your friends. To make the home or office show worth while for you and me please invite at least ten friends or employees. I will provide some small snacks and if you would like to add to your guests enjoyment, you can do the same. I am available in the greater Philadelphia area, in areas that are within an hour driving distance around Northeast and Northwest suburbs and towns. If you’re interested in having a party at your home, office or organization, please contact me for more information. Your party can be any size. I can bring a small, medium or large set-up (even a tent!). 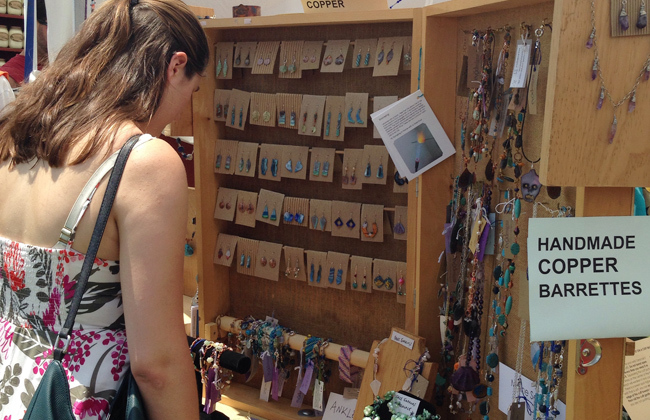 Jewelry parties are fun, and you may even have other vendors at the same time. Or, you might have a very cozy get-together with a few friends. Send an email to find out more or inquire about a date!